Despite seeing Daventry Town bow out of the Emirates FA Cup, joint manager Arron Parkinson was not too downbeat. Worcester City will face Chasetown after overcoming a resilient Daventry 1-0 in Saturday’s extra preliminary round tie. A keenly fought encounter was settled by a solitary first half Dave Reynolds header. Both sides have had memorable runs in the FA cup in recent times. Worcester City having won at Coventry City while Daventry were close to taking Chesterfield back to Communications Park for a first round replay. Both teams created chances a plenty of chances, player manager Lee Hughes fired just wide of Ant O’Connor’s upright. But Town replied when Phil Cassidy’s shot was deflected wide for the first of six first half corners. Town’s third corner was headed just over the bar by Kieran Fitzgerald, playing his first game after returning to the club. 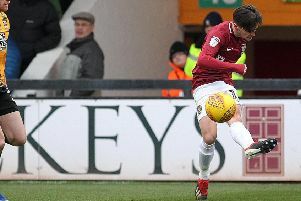 Peter Dearle went close with a header that lopped over the bar from another corner before Town had a penalty appeal waved away when Fitzgerald went down in the box. City broke and former West Brom striker Hughes had a shot block by O’Connor. The game then turned when Town were forced into a change after Dean Lukeman picked up a serious looking knee injury. City took a quick free-kick which found Aaron Griffiths and his cross was headed home Reynolds from close range. Both keepers made decent saves in the second half, O’Connor’s was the pick of the bunch as he tipped over a header while Matt Gwynne made fines stops from Adam Confue and Fitzgerald.